My family vacation is over (I think...) and I'm BACK! Don't celebrate yet because I'm still running of 3 cylinders, but at least you get a new What Am I? quiz -- this one from my cell phone camera. What are you looking at...punk? Eclipse? I didn't look at it the image, just guessed. My parents are keeping me inside so I don't stare at the sun today. Oh snap -- I totally bailed on the eclipse -- WAY TOO MUCH PRECLIPSE SCOTCH! Preclipse scotch is one of 3 valid excuses. We also would have accepted Depression Due to Eclipse-induced Pseudoseasonal Dysphoria and Broken Typing Hand After Fighting Stranger for Eclipse Viewing Glasses During Smokebreak on the Patio. Tailight....hmm...late 1970's early 80's Ford??? Ltd ish maybe? Double side molding. VW Ghia's had double side molding nothing as wide as that. Looks like its stainless, so it has to be pretty old.
' 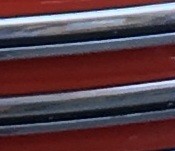 48 Merc on the molding?